Finally Released – Mea Culpa’s Contribution for MVW 2011! There they are, the official outfits of Miss Egypt 2011. On the 18th of december was the finale of the Miss Virtual World 2011. Mea Culpa made both dresses, country costume and the formal gown for Miss Egypt 2011. Perfectly matching to the rest of the outfit this huge headpiece. A huge flower looking part covers the left side of the chest. Typical for egypt are the mixture of gold and different blue tones what was perfectly made for the “Fate of Osiris” Again an amazing creation of TatankaKaligawa , genius designer of Mea Culpa. 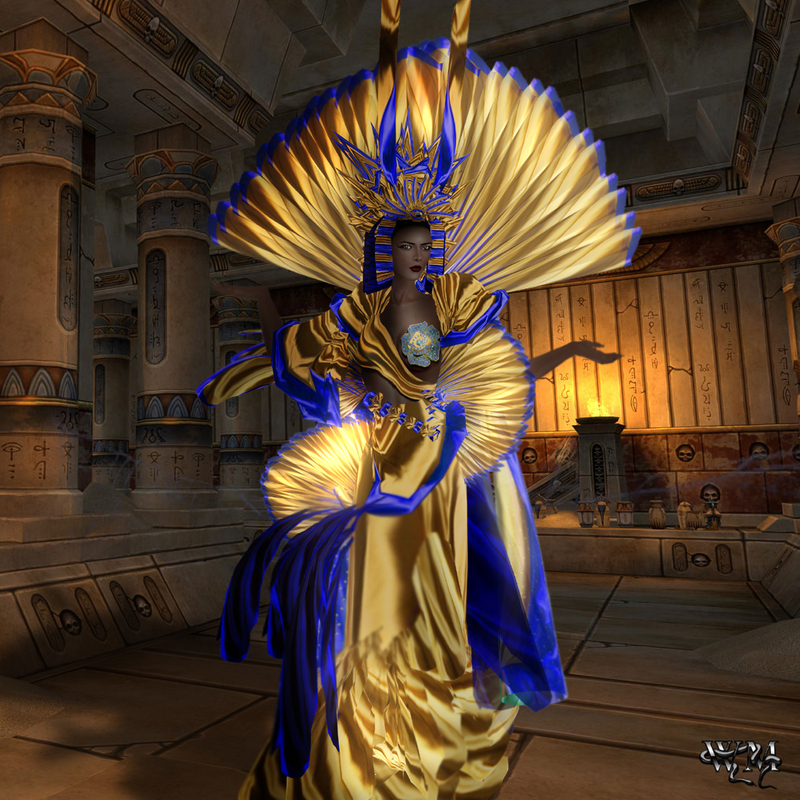 The second outfit was made for the formal entry of MVW 2011 also for Miss Egypt of that year. The amazing “Obscure Elation” let remind of kinda peacock theme but done in the way of Mea Culpa 😉 This wonderful gown will turn heads for sure. The great flexible parts in the back wave around you with every movement and the great highlights are for sure also the jewelry parts like the 2 brooches at the chest and on the hip and the glamorous headpiece. This entry was posted in Fashion, New Releases and tagged Aida Ewing, Arisia Ashmoot, Avant Garde, Best of Secondlife, Blog, Blogger, Bory Talking, BOSL, Frolic Mills, Glam Affair, Haute Couture, Latest Release, Mea Culpa, metaverse, Metavirtual, Miss Egypt, Miss Egypt 2011, Miss Wirtual World, Model, Modeling, MVW, MVW 2011, New, New Release, News, photographer, Photography, Pose, Poses, Release, Scondlife, Second Life, Skin, SL, SL Photographer, Tatanka Kaligawa, Virtual World, virtualworld, Wicca Merlin. Bookmark the permalink.